Key diplomats from the P5+1 and Iran concluded intense, prolonged negotiations on Tuesday to finalise an agreement on Tehran's nuclear program. Russia, a part of the P5, (permanent UNSC members) was actively involved in ensuring that an agreement was reached. Moscow pushed the deal despite concerns that Iran's re-entry into the global oil market, once Western sanctions on Tehran are lifted, would cause oil prices to fall, hitting Russia's own coffers. Crude oil is Russia’s largest item of export. Iran has got a nuclear deal. It may not be perfect but, on July 14, negotiators from the five permanent members of the UN Security Council and Germany (P5+1) and Iran announced in Vienna that they had arrived at a workable agreement. The almost continuous, marathon round of negotiations to finalise a deal, that re-started on June 27, concluded on the banks of the Danube on Tuesday, July 14. The United States, Russia, China, France, Britain and Germany and Iran agreed on a gradual removal of international economic sanctions imposed on Tehran in exchange for major restrictions on the Iranian nuclear program, the aim of which, according to the West, is to build nuclear weapons. Russian President Vladimir Putin immediately welcomed the agreement saying, "today the world has breathed a sigh of great relief." The Russian Foreign Ministry said "the political-diplomatic approach to solving the problem has prevailed, one that Russia had always advocated," and expressed hope that the agreement would strengthen the nuclear non-proliferation regime. Russian Foreign Minister Sergei Lavrov, who was actively involved in finalising the deal’s details, said Russia would actively participate in implementation of the agreement. Iran's enriched uranium will be shipped to Russia in exchange for supplies of natural uranium. Russia will also participate in converting Iran's uranium enriching plant at Fordow. Analysts said the future of the signed agreement may not be as rosy as it now appears and that Russia's participation in its implementation could be called into question. Dmitry Yevstafiev, from the Centre for Policy Studies in Russia, estimated the chances of the agreement's implementation at 50-50, since approval of the compromise reached in Vienna could be difficult to obtain within Iran. Meanwhile, Pyotr Topychkanov, a collaborator from the Problems of Non-proliferation Program at the Moscow Carnegie Center, noted that "there are influential opponents to the agreement both in the West and in Iran," and a lot will depend on how they behave. According to Lavrov, the implementation of the agreement will strengthen the economic ties between Moscow and Tehran. A number of important agreements between the P5+1 and Iran were made in April in Vienna. Iran consented to reducing the number of centrifuges and the quantity of its low-enriched uranium reserves, as well as agreeing to the conversion of a series of nuclear facilities and to accept stricter inspections from the IAEA. However, according to the mass media, the sides could not agree what to do with the arms embargo that had been imposed on Iran in 2010, as well as on the mechanism for lifting the sanctions. 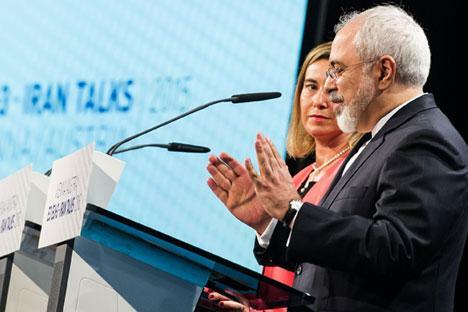 In the end, the sides agreed that the UN ban on arms supplies to Iran will remain in force for another five years and in order to observe the implementation of the agreement a special committee will be created and headed by High Representative of the European Union for Foreign Affairs Federica Mogherini. In the event Iran violates the agreement, the UN sanctions can be renewed within two months. "We have big plans with Iran to develop Iranian nuclear energy," he said. Radjab Safarov, director of the Russian Center for Modern Iran Studies, explained that besides energy, the cancelation of the sanctions would give Russian companies a series of opportunities in Iran in the fields of chemical industry, information technology, railroad construction and several other sectors of the economy. Cooperation in the military-technical sphere also holds significant potential for the two countries, a fact testified to by the deal to sell Iran the Russian S-300 antiaircraft systems. According to media reports, the value of potential contracts in the military-technical sphere ranges from $20-70 billion. "Russia needs Iran as a serious partner,” said Dmitry Yevstafiev. "First and foremost, Iran is seen in Russia as an economic partner. Iran's ideological foundation for us is still too exotic for forming a political partnership," he said. Besides the sheer trade contracts, said Yevstafiev, Iran also has an important logistics role. Russia is very interested in the North-South transportation corridor from Europe to Asia, in which it will have an 80-percent stake. Cargo from India and other Southern Asian countries can be shipped along this route through Iran and Russia to northern and southern European countries. "Iran is fundamentally important for Russia in terms of forming a multi-directional foreign and foreign-economic policy," said Yevstafiev. Iranian oil – a challenge for Russia? In the context of the economic consequences that the lifting of sanctions against Iran will have for Russia, the world’s mass media is actively discussing the possibility of a decline in the price of oil – Russia's main export – after the market is flooded by Iranian oil. However, analysts believe that the situation is not so clearly defined. "If we look at it from a purely pragmatic viewpoint, then of course the appearance of Iranian oil for Russia is disadvantageous since Iran will be a rather serious player on the oil market," said Radjab Safarov. "In half a year Iran will have new capacities. It will market about 1 or 1.5 million barrels of oil daily." But Safarov believes that this would have negative consequences for Russia only in the short term, since oil production is primarily controlled by OPEC and Tehran will reassume its quota within the organization's general volume of production, a quota that was given to Saudi Arabia after the introduction of Western sanctions against Iran. The net result of this would be that Riyadh would have to reduce its oil production. Announcing the agreement on Iran’s nuclear program, Sergei Lavrov also reminded everyone of U.S. President Barack Obama's promise to renounce plans to install missile defense systems in Europe in the event Iran's nuclear program is regulated. According to Yevstafiev, Lavrov was just "testing" Obama. Topychkanov, on the other hand, believes that this is a determined message to the West, with the aim of reminding it of its earlier declarations.